Detroit, MI (May 14, 2009) - The "Pure Michigan Bayview Mackinac Race" title was chosen by the Michigan Economic Development Corporation's (MEDC) Travel Bureau and Bayview Yacht Club as the official name of the 85th sailing of the 2009 race that starts in Port Huron. Interested in learning to sail but feel like youâ€™re navigating in murky waters? 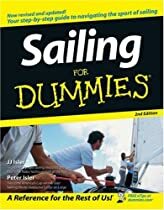 Sailing for Dummies, Second Edition introduces the basics of sailing, looks at the different types of sailboats and their basic parts, and teaches you everything you need to know before youleave the dock. Sailing for Dummies shows you that getting out on the water is easier than you think. The authors keep the sailor-speak to a minimum where possible, but give you a grasp of the terminology you need to safely and effectively communicate with your crew. A textbook, userâ€™s manual, and reference all in one, this book takes the intimidation out of sailing and gives you the skills and confidence you need to get your feet wet and become the sailing pro youâ€™ve always wanted to be. Anchors away! For the first time, Chicagoans with dusty surfboards in their garages or basements can start thinking about legally hanging 10 in Lake Michigan, perhaps as early as this summer. Erosion of the St. Clair River has caused the water level in Lake Huron to drop by 12 centimetres over the past half-century, but nothing should be done about it, a much-anticipated binational Great Lakes Water study concludes. In case you missed it, Charles Plueddemanâ€™s latest story for Boats.com had an important message for you, that is, if youâ€™re someone who ever uses a boat that has a gasoline engine aboard. More ethanol could be coming to a gas pump near you very soon. WEST MICHIGAN -- There's no doubt area boaters are looking forward to warmer weather so they can get out on the water. Before their boats get wet, people should make sure they're in a "dry" frame of mind -- in other words, leave the booze behind. BOYNE CITY â€” For now, the city will continue to allow people to moor their boats off city road-end access sites despite complaints about the practice from neighbors. The issue came before the Boyne City City Commission at its regular semi-month meeting Tuesday. The dispute surrounds a long-standing practice of non-lakefront property owners mooring their sailboats in the city-owned riparian area off the end of Charlevoix Street on the cityâ€™s north side. Best fishing ever at Lake Michigan? ST. JOSEPH, Mich. â€” Carl Stopczynski had reason to smile when our group stepped aboard his 41-foot Trojan early Tuesday morning. The burly charter captain, known as "Fuzzy Bear," had just won his second straight Hoosier Coho Classic salmon tournament in Michigan City. He's the first back-to-back winner in the 35-year history of the event, and he did it with a record catch. LAPEER -- Training and preparation could have prevented many of the 201 boating accidents and 36 resulting deaths reported on Michigan's waterways last year.